When the Missionary Oblates arrived in Haiti 75 years ago, most of the poor were largely being neglected by their clergy. There was a debilitating sense of hopelessness in society, and unfortunately most priests chose to isolate themselves from the problems of the poor. But when the Oblates arrived from the United States, they brought a different attitude, one of solidarity with the poor. They opened parishes in the poorest neighborhoods, ministered to people living on the streets, and opened schools for impoverished children. The early Oblates in Haiti were fulfilling the commandment of their founder, St. Eugene De Mazenod, to “lead people to act like human beings, first of all, and then like Christians and, finally, to help them to become saints.” The Oblates continue to follow that commandment every day. Today Fr. John is one of 110 Oblates ministering in Haiti. The Oblates are the largest male religious congregation working in the country, and most of them are now native vocations. There are also 25 men who are discerning or being educated to become Missionary Oblates. The Oblates staff 24 parishes and run several primary and secondary schools. They have programs to help people of all ages who have one common characteristic – they are the poorest of the poor. In Quanaminthe the Oblates run the John Paul II Institute, a school for 200 children who come primarily from families who became refugees after natural disasters. The families are so poor that they cannot afford the school uniforms and fees to attend the schools run by the government. So without John Paul II Institute, these children would have no place to receive an education. In Les Cayes, the Oblates are responsible for Foyer St. Etienne, a nursing home for the elderly poor. Residents at the home would be living their final days on the streets if not for the Oblates. Instead, they live their lives in modest comfort, with their basic physical and spiritual needs being met. If patience is a virtue, then the people of St. Anthony of Padua Parish in Fon Eles, Haiti are some of the most virtuous people in the world. In 2010 an earthquake devastated Haiti including the town of Fon Eles. Thirty parishioners from St. Anthony were killed in the earthquake, and all of the buildings reduced to rubble. The parishioners, along with their pastor, Fr. Joe Corriveau, O.M.I. were determined that the earthquake would not end their parish. They began to slowly rebuild. Shortly after the rubble was cleared, the people of St. Anthony constructed a makeshift building to serve as their church, a tapestry of tarpaulins and sheet metal. During Mass the parishioners asked for one blessing every day – that a new church would rise from the rubble. Four months after the earthquake on the feast of St. Anthony, Fr. Joe knew that his beloved parish was back, even though it was still primarily a tent church. On that day, 61 children made their First Communion during a 2 ½-hour Mass. “It was filled to the brim and believe me it was hot like an oven, which did not seem to bother anybody except me,” Fr. Joe joked. For more than four years Fr. Joe raised funds to rebuild his parish. Every time some money would come in, part of the construction would take place. Eventually the new church was completed. Then the hurricane season arrived, and Hurricane Matthew blew most of the parish away. After Hurricane Matthew Fr. Joe and his parishioners did not give up. They began raising funds and rebuilding. It took nearly two years of work until the parishioners celebrated the consecration of their new parish church on June 13, 2018. 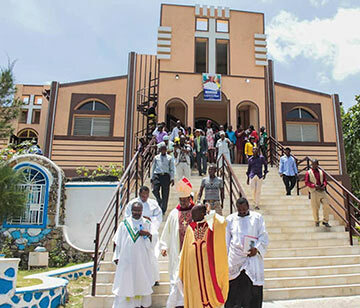 The consecration Mass lasted 3 ½-hours and was attended by dignitaries including the Archbishop of Port-au-Prince. A choir of 40 voices sang hymns in Creole while Mass was celebrated in French. There was a large offertory procession of 15 Haitians, some carrying baskets on their head containing fruit and produce. Even a live rooster, chicken and goat were presented to the Archbishop. Father Joe beamed with pride during the celebratory Mass. It was one of the happiest days of his 57-year ministry in Haiti. He concelebrated the Mass with the parish’s new pastor, Fr. Michard Jean-Jacques, O.M.I. Father Joe has known Fr. Michard his entire life, having baptized him as an infant. After the Mass Fr. Joe sent a letter to benefactors who had supported his rebuilding odyssey over the past eight years. He wanted them to be aware that their perseverance had finally paid off. A la llegada de los Misioneros Oblatos a Haití hace 75 años, el clero local había descuidado por largo tiempo a la mayoría de los pobres. La sociedad tenía una sensación de desesperanza y desafortunadamente, la mayoría de los sacerdotes eligió aislarse de sus problemas. Pero al llegar los Oblatos provenientes de los Estados Unidos, había en ellos una actitud diferente: de solidaridad con los pobres. Abrieron parroquias en los vecindarios de mayor pobreza, trabajaron con las personas que vivían en la calle y abrieron escuelas para los niños sin recursos. Los primeros Oblatos en Haití cumplieron el mandato de su fundador, San Eugenio de Mazenod, de “llevar a las personas antes que nada, a actuar como seres humanos, luego como cristianos y finalmente ayudarlos a convertirse en santos.” y siguen cumpliéndolo hoy en día. Actualmente, el P. John es uno de los 110 Oblatos que trabajan en Haití, siendo la mayor congregación religiosa masculina del país. La mayor parte de ellos son ya vocaciones locales y hay 25 jóvenes discerniendo o en camino a ser Misioneros Oblatos. Los Oblatos están en 24 parroquias y dirigen varias escuelas primarias y secundarias. Cuentan con programas para ayudar a la gente de todas las edades, con una característica en común: son los más pobres de los pobres. En Quanaminthe, los Oblatos están a cargo del Instituto Juan Pablo II, una escuela para 200 niños provenientes en su mayoría de refugiados tras desastres naturales. Las familias viven en tanta pobreza que no pueden costear los uniformes y pagos escolares para asistir a las escuelas públicas. Así que sin el Instituto Juan Pablo II, ninguno de ellos tendría acceso a la educación. En Les Cayes, los Oblatos son responsables de Foyer St. Etienne, una casa para ancianos pobres. Los residentes podrían haber pasado sus últimos días en la calle, de no ser por los Oblatos. En vez de ello, pasan sus días en un modesto confort, con sus necesidades físicas y espirituales básicas cubiertas. Si la paciencia es una virtud, la gente de la parroquia St. Anthony of Padua en Fon Eles, Haití, es la más virtuosa del mundo. En 2010 un terremoto devastó Haití, incluyendo a Fon Eles. Treinta feligreses de St. Anthony perdieron la vida entonces y todos los edificios fueron reducidos a escombros. Los feligreses, junto con su pastor el P. Joe Corriveau, O.M.I. decidieron que el terremoto no pondría fin a su parroquia y comenzaron a reconstruirla lentamente. Poco después de remover los escombros, la gente de St. Anthony construyó un edificio provisional que sería su iglesia: una lona y una lámina. Durante la Misa, los feligreses pedían a diario una bendición: que su nueva iglesia se levantara de entre los escombros. Cuatro meses después del terremoto, en la fiesta de San Antonio, el P. Joe supo que su amada parroquia estaba de regreso, aunque aun fuera una lona. Ese día, 61 niños hicieron su Primera Comunión, en una Misa que duró 2 ½ horas. “Estaba repleta en su totalidad aun cuando el calor era agobiante y pareció no molestar a nadie, excepto a mí”, bromeó el P. Joe. El P. Joe recaudó fondos por más de cuatro años para la reconstrucción de su parroquia. Cada vez que se recibía algún dinero, se construía una parte, hasta que finalmente estuvo terminada. Luego llegó la temporada de huracanes y el Huracán Matthew se llevó la mayor parte de ella. Tras el huracán Matthew, el P. Joe y sus feligreses no se dieron por vencidos y comenzaron a recaudar fondos para reconstruir de nuevo. Les llevó casi dos años de trabajo, hasta la celebración de consagración de la nueva iglesia, el 13 de junio de 2018. Varios dignatarios llegaron a la Misa para esa ocasión, incluyendo al Arzobispo de Puerto Príncipe. Un coro de 40 voces entonó himnos en criollo y la Misa fue celebrada en francés. Para el ofertorio hubo una larga procesión de 15 haitianos, algunos portando en la cabeza canastas con fruta y productos. Incluso se presentaron al Arzobispo varias aves y una cabra vivos. El P. Joe no podía ocultar su orgullo durante la Misa de celebración. Fue uno de los días de mayor alegría en los 57 años de su ministerio en Haití. Concelebró la Misa con el nuevo pastor de la parroquia, el P. Michard Jean-Jacques, O.M.I., a quien el P. Joe ha conocido toda su vida, desde que lo bautizó. Después de la Misa, el P. Joe envió una carta a los benefactores que apoyaron su odisea de reconstrucción en los últimos ocho años. Deseaba hacerles saber que su perseverancia había finalmente rendido fruto.